Have you tried the electrical factors next ind est down from tp? The Electric Centre - yes I use them for quite a bit of my incidental needs. I've found them pretty helpful. Well I've fitted the SWDM-10 module to the inverter. Pretty straight forward although the cable outlet from the module isn't perfectly aligned with the 14 pin header intended for it to fit and fitting is a bit fiddly and, contrary to what the manual indicates, it is an 'open' 14 pin header and not the latching type - I can see why they would have changed it as it would be all to easy to get things misaligned particularly as it is 'recessed'. Ignore the comment re a module having been previously installed as there was a plain grommet fitted - I was getting confused. As I have the lower cover off I'm going back out there to fit the DC isolation switch and cabling/ plugs to the inverter. Now done. I noted there was an onboard flashing green LED on the module as I put the bottom cover back on suggesting it might be installed correctly - until we get it hooked up to a router I won't know for sure. I note from the Immersun that the Growatt discharged some power circa 1800 - 2100 amounting to 4.8kWh if it is to be believed. After a slow start that's me been out and about doing more 'jury rigged' installing. 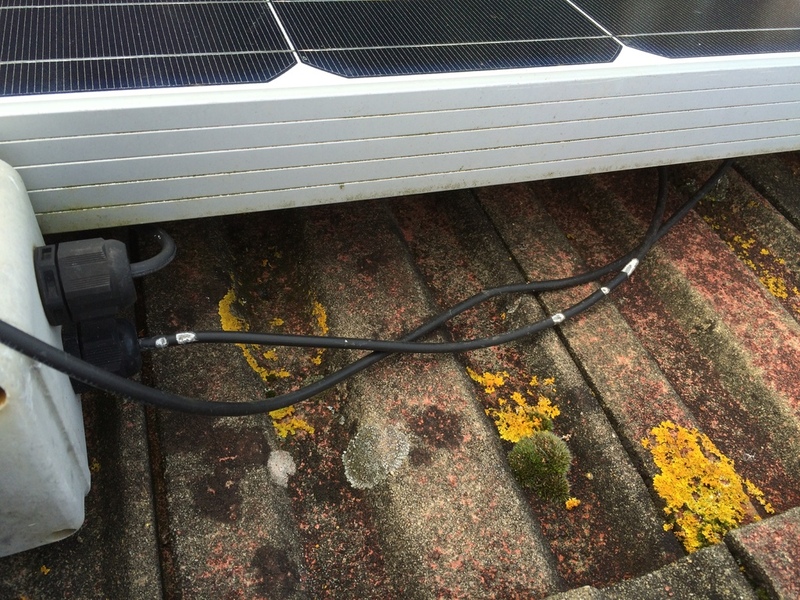 Started off before lunch running another pair of 6mm2 Solar PV cable for the 'new' 1500W of UBG panels - spot the state of the art spooling equipment. The postman delivered the 'Stick's like S**t' at lunchtime so I got straight on with doing the last three panels and then got back to running the cable. Then came the bit where we made sure the right plugs were fitted or wire ends were secured in the switch. We now have the 6 'new' panels plumbed in and doing their bit to save the environment (even if they have already been doing that for 4yrs previously in whichever PV farm they came from). I noted that the inverter when starting up is telling me that 'SMA COMM A/B - NC' which I'm taking as another sign the data module is connected correctly. I recall that it takes about 3 years of use for solar panels to recoup their manufacturing carbon footprint, so that means they are already carbon neutral. I haven't run out of router/ modem ports yet but only because I'm still umming and aahing over whether to terminate my BT Broadband contract and just stick with the ee mobile option. I think I need to see if we can survive on just the ee mobile option and if it doesn't work then I'll have to go back. In anticipation of this I have ordered an 8 port switch this evening. I should end up with all four ports on the router and 4 ports on this switch being used currently. I should have my son out to help me tomorrow so looking forward to getting these panels on the roof. Have checked all the mounting bits and I seem to have enough to do the job. The weather forecast for tomorrow is good so fingers crossed the plan comes together. It's nice working with the son. Good memories for the future.. It's all good. Enjoy ! England hammered us but we might make a comeback and win it yet. Thanks. That's me counted out the various mountings and brackets to make sure there are enough. I've just marked out the rails and will be outside shortly to drill them. Glorious sunny weather here but currently around 0oC. Seems a shame to have to be taking panels down to complete this job but it's only the one day's loss. One of the 'new' UBG Trina panels is definitely a problem 'baby'. The inverter is giving me the bad earth signal. I'll need to check it out - watched SMA YouTube video https://www.youtube.com/watch?v=1hjEnosPVl4&feature=youtu.be which gives a very simple test to carry out. I'll give it a dose of CVI (Close Visual Inspection) and replace the plugs and open up the junction box sometime later. I don't want to wind the English rugby fans up but on the day the best team did win yesterday - I imagine there will be some very sore players on both teams this morning. Richard - I've nothing to contribute to this thread but please keep i going, it's one of the better reads on the internet just now!! What that video does not tell you is that depending on the readings you can estimate where the fault is. For example if you get a higher voltage (to earth) on pole +, than pole -, then the fault will be nearer the end of the string connected to the Pole + lead. If the voltage is the same on both the fault will be in the middle of the string. Another thing you can do is turn the earth monitoring down to the minimum setting, go to Settings > Grid Monitoring > Minimum Insulation Resistance and set it at the lowest setting which on your inverter is 300kOhm. I had to do this on mine after squirrels chewed the insulation off my cables. Even after repairing them with self amalgamating tape, the inverter would occasionally complain in the rain, but stopped doing this after I reduced the monitoring setting. Out of curiosity how do you disconnect yours? I have solar edge optimisers which makes it a doddle to mess around with the wiring as there isn't any voltage in the wires (well 0.5V or something like that). Do you have to do it before sunrise or get a big blanket? I isolate the string at the disconnect switch. Well as we broke for lunch we had managed to get No.6 of the 7 Tianwei panels mounted having removed the 18off 80W panels and the top rail. We'll shortly be going out to, hopefully, get all the large panels back up by close of play. I intend putting the suspect panel at the end of the run so it easily accessible (still to be investigated). I'm still debating whether to rig these panels as the one string or two. I've run the extra cabling so have the choice. Are you sure those panels are OK to be fixed on the short sides like that and there don't seem to be many clips holding the rails to the sheeting? Honest straightforward answer would be I don't know. We are in a relatively sheltered area (that's why there is no wind turbine up) and the 5 Tianwei panels that were mounted have survived since around last April. Time will tell I guess? I've attached a couple of pictures I wasn't able to take last night as it was near 1800 when we finished and pretty dark. Just about to work out how to replace the other existing panels to maximise the rails in place.